I recently sat down with my kindergarten team to look at our standards and do some big picture planning for the upcoming quarter. As we were unpacking the standards, we also talked about where in our day we could best teach the expected curriculum objectives. It became very evident to all of us how critical our morning message is, especially in the area of phonics and word work – but really in all curriculum areas. Morning message is a daily occurrence rich with learning possibilities. It’s where the heart of my word work and phonics instruction occurs. 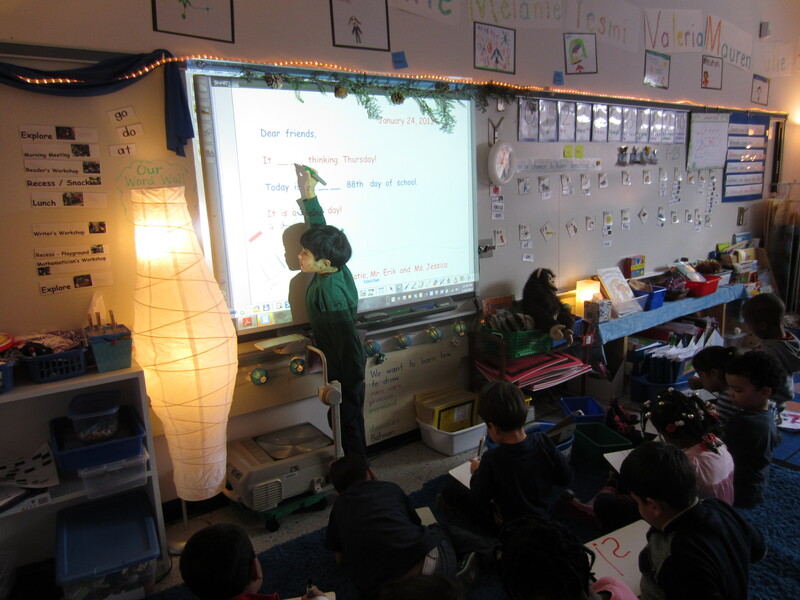 My children come together on our blue fuzzy rug in front of the SMARTboard with their own whiteboard and marker to begin this daily routine. The message is pre-written and carefully planned to address a variety of differentiated teaching objectives and to engage the children in playful learning. I often include pictures of the students and our classroom, book covers, things we are studying or wondering about, as well as predictable text that children can read. There are places for the students to fill in missing words and opportunities for them to interact with the message as we read and respond to questions within the message, circle or highlight words we know or things we notice, and fill in high frequency words to make our message make sense and sounds good. We read it together first as a shared reading experience. Then we go back and fill in missing words and look for things we notice in the message. I ask the children “what do you notice?” and invite them up to the board to show us and explain what they see. 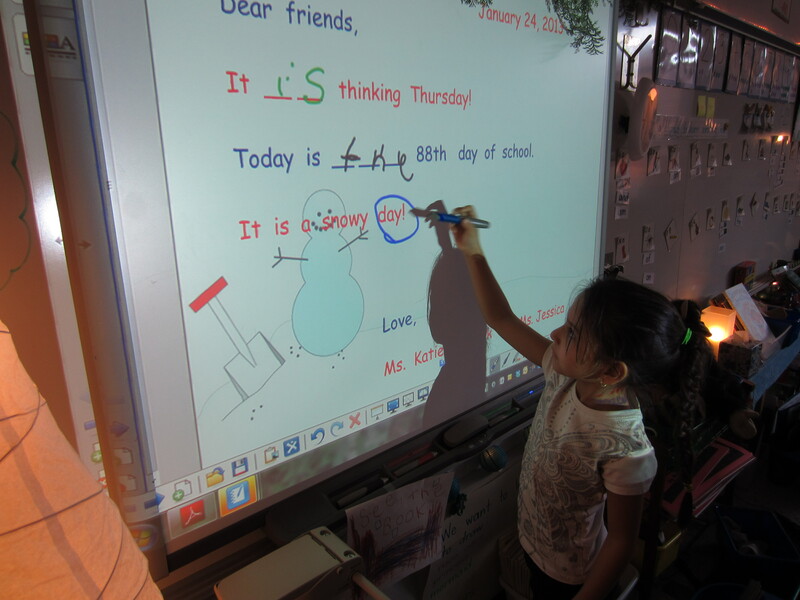 The children follow along, writing on their own individual white boards while one child is writing on the SMARTboard. Children may notice familiar high frequency words, letters that are the same as in their names or a friend’s name, days of the week, numbers, punctuation that they have seen in another book, words they know, etc. I always ask them to share what they notice first, and then I move into my teaching point. For many years I did this on chart paper but one great benefit of having a SMARTboard is that I can now print it out and send it home. I print a two-sided copy – one side is the message as it looks at the beginning of our learning before we have interacted with it, and the other side is printed after we have marked it up with our thinking. This message goes home daily and is a great way to share our learning with our families. It is the 70th day of school. Do you think it will snow today? Make your sentences obvious. I write one sentence on each line and alternate colors. This is similar to beginning texts that children are reading and helps children see the different sentences clearly. It provides another teaching opportunity to differentiate between a word and a sentence, as well as making it easier for children to read. Always read the message together first and then read it again at the end of your lesson, especially if you have filled in missing words. You want to keep meaning at the forefront and give the children multiple opportunities to engage in shared reading of the text. I use a pointer to model one-to-one match and directionality. Keep it short and fast paced. My morning message lessons typically last about 10 minutes. I choose 3 students each day to come up and interact with the message. Having individual whiteboards available allows all children to be engaged throughout the lesson. 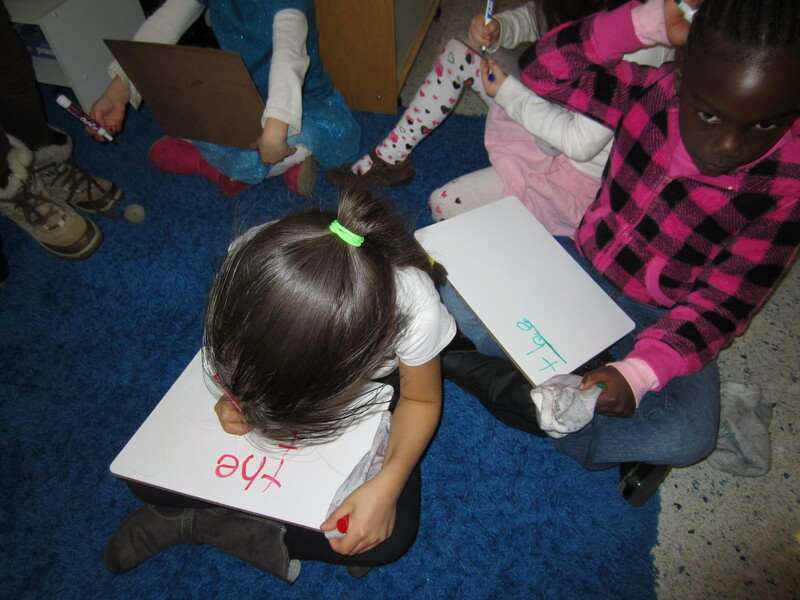 High frequency words – I use the morning message to introduce our new word wall words each week. There are so many possibilities for teaching with morning message. It’s a time that children love, it builds community and is rich with authentic literacy learning. Do you use a morning message in your classroom? What ideas do you have? Please share! LOVE THIS post! I also do similar things with my grade ones. They love it, and the predictability of knowing the pattern of some of the words (especially my vulnerable readers). 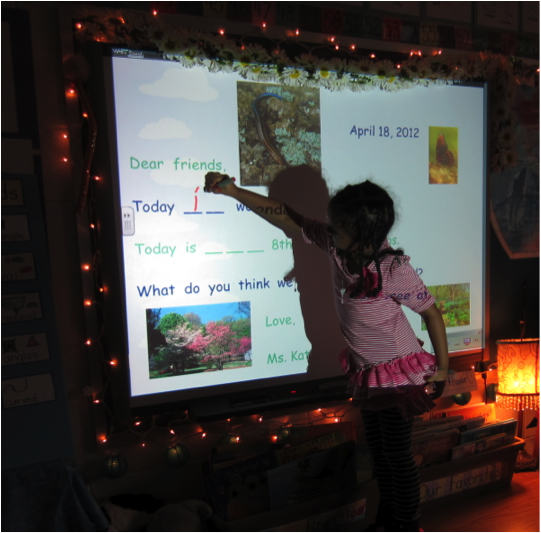 Thanks also for sharing about your SMARTboard. I feel like they are getting a bad reputation lately when they can be such a great tool in the classroom. I enjoy reading this blog and have high regard for your expertise. I am, however, becoming dismayed about the content of your kindergarten program as it seems more suited to grade one than kindergarten. I know there are curricular expectations that we need to comply with and I also believe it is our moral imperative to speak out when curricular objectives do not match developmental stages for children. I believe our kindergarten programs should be play-based, have a strong oral language component and be staffed with very skilled teachers who can scaffold each child to their next level of learning. Thank you for your comment. I completely agree and my beliefs are also that a kindergarten curriculum is play-based, having a strong oral language component and very skilled teachers working with each child within their ZPD to scaffold their learning to the next level. I do have state standards to follow, and although we do not have the Common Core, my state standards are quite extensive. They do look more like what was common in first grade for many years. I don’t agree with this, however, I use the standards as a departure point to the learning that occurs in our classroom. I am always looking at each child and where they are in their learning. Being responsive to students academic and social needs is how I plan our day. I make certain that my practice is developmentally appropriate and am very familiar with NAEYC standards on developmentally appropriate practice, as well as the vast amount of research on the importance of play. Play is how children learn, and is a big part of our day. I am very fortunate to be in a county that supports that philosophy. I have spoken out many times in the past when curricular objectives are not developmentally appropriate. So I think we are completely on the same page here. I guess I’m not sure what exactly you are becoming dismayed about. I would love for you to clarify and I would be happy to clarify any misconceptions I may have created. In regards to our morning message, which I am assuming you are referring to in this post – this is a very small part of our day – 10-15 minutes max. The children are engaged at their level, and are supported as we explore components of phonics and language use within a meaningful structure that they love. If I can explain or clarify anything else, please let me know. Loved your post today! I would love to see a copy of what your typical day looks like as far as a schedule. Is that a possibility? That will be great! Not sure if you remembered me…the scarf chick in Ohio last year! Thanks so much! To Mary – I just thought I’d add my two cents here too. As one who has visited Katie’s classroom many times, I can tell you that play and oral language are very much her first concerns. (In fact, she developed a course called “Play and Language” for American U. and has taught that.) Because she has so many children who are second language learners and who come from very diverse backgrounds, she works very hard to meet all their specific needs. Perhaps it was that long bulleted list that Katie included in this post that made you think her morning message was more like first grade. My guess is that she was saying, “these are many of the things that can be focused on during morning message in any of the K-2 grades” (as Katie has taught all those grades.) Her morning message is very appropriate for her kinders. In any event, we thank you for your comment. It’s always good to reflect on our practice. 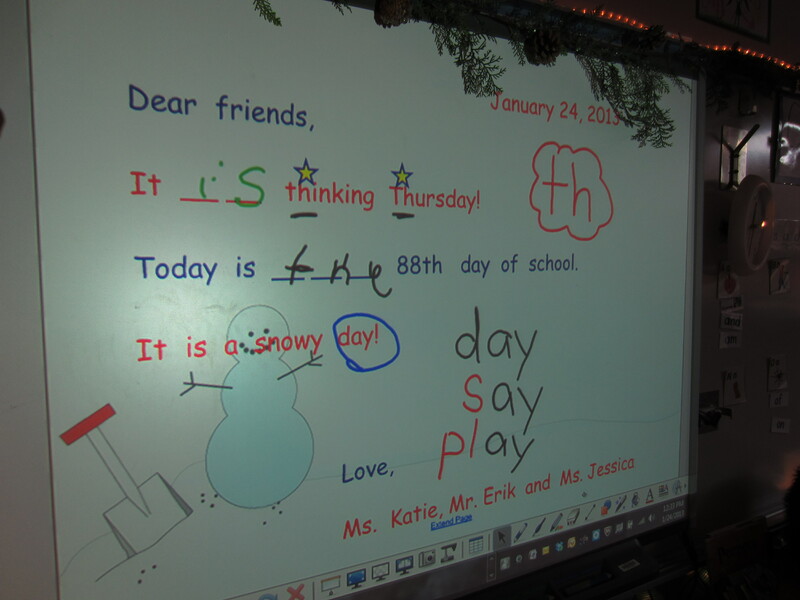 Have you had an opportunity to look at Katie’s blog that she does with her kinders? You can get a real picture there of many of the things that go on in her classroom. I am a parent of a child in Katie’s class. We love the morning message! He brings it home and reads it to us with enthusiasm every day. It has not gotten old after 95 days (we know that it’s been 95 days from the morning message). It has been a great way for him to start talking to us about his day and usually is a lead-in to other stories about his day. He is lucky to have such a great teacher! I’ve done the morning message this way for many, many years – well before SMARTboards. I would do it on big chart paper, using alternating colors of markers. The kids would use another color marker to write in, circle what they notice, etc… When I did it this way, I would hang the charts in the room so kids could revisit it all week. On Friday, 5 different kids got to take home a message. We rotated so everyone got a turn to take a message home. It would be a little more work to send it home daily, but you could always type it up and have a helper of the day write on it each day – then copy and send home. Hopefully one of these suggestions works for you. I appreciates your insight and further explanations around the morning messages and fostering literacy through multiple ways with one tool. I need to use white boards more. Hi Katie. I really like what you are doing with your SMARTboard. We do a similar morning exercise in my kindergarten classroom but because we are an Eco school, we “tweet” out our discoveries to our families every day in order to save paper. You could easily attach the before and after pictures of your message for a visual or email both pictures to parents! This is a great post — I’ve had this tab open for days so I can re-read and not forget. I’d like to hear more about the children using white boards during the message work. I assume they are writing the same words as your ‘helper’, is that correct? I think it’s a great idea & have been trying to incorporate more individual white board work with our whole group work. BTW, California State Standards are ridiculously immense and over the years I have found morning message time one of the best ways to hit them. I have use the Morning Message in India- bilingual- teaching both Hindi and English. I have used it with 3+ to 4 and 4 – 5 year olds. It works. I have used a white board, a flip chart, even a black board – a smart board is a great asset, but you can get the same results with out it. In my years of classroom experience, the Morning Message is one of the most powerful tools to engage children and make literacy authentic. Hi Katie! Do you have a video of morning message you would be willing to share! I don’t, but that’s a brilliant idea! I will work on doing that in the next week or so and post it. Thanks for reading! Hi Katie! Did you ever post a typical day in your classroom? I see it referenced in a post but I can’t find it. Thank you! Hmmm. I’m not sure if I ever posted it that. But I will! I’m often asked how my day looks, so I will put that out there. Thanks! Thank you again! You have given me more ideas for our Morning Message time!